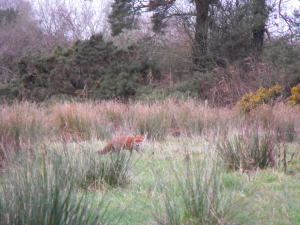 Observation - FOX HUNTING IN RUSHES - UK and Ireland. Description: A fox hunting for rodents or weak and hungry birds during our cold weather temps of -11 drove all animals out to search for food. A fox hunting for rodents or weak and hungry birds during our cold weather temps of -11 drove all animals out to search for food.